Give a call to Ryan's for all your insulation needs. We specialize in attic insulation, injection foam, blown-in insulation, soundproofing, ice dam removal and prevention. We're fully licensed and insured. We also have BPI certified installers that we use for every insulation job we undertake. If your wondering about the differences between different kinds of insulation or need an estimate to start a new project please give us a call. We run a full time insulation department with experienced installers. All our insulation crews take ongoing factory training and certification. With today's energy efficient high-performing products it's never been easier to upgrade your home's insulation with some affordable insulation from Ryan's. Need additional information before hiring your insulation contractor? Our insulation showroom is a great place to learn about all the different types of insulation, including attic, blown-in and injection foam. Don't settle for some unknown contractor - trust Spring Valley's best - Ryan Insulation! One big request we get is for soundproofing. Soundproofing is best achieved through acoustic insulation products, which can be placed between walls, floor boards, ceilings and other areas to drown out sound and provide a private setting for your home, apartment or business. Soundproofing is common for both residential and commercial buildings. Spring Valley's top ice dam prevention & removal company is Ryan's. We've helped hundreds of homeowners with their ice dam problems over the last few winters. During the winter months our teams run full time removing ice dams for clients and helping with ice dam prevention for those who need it. 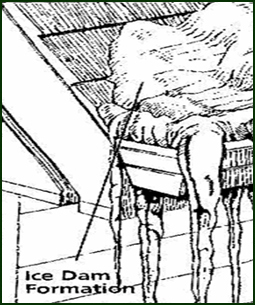 If you have a ice dam problem with your home or business please give us a call. Call today for more information.